Being vegan is an absolute no-brainer. 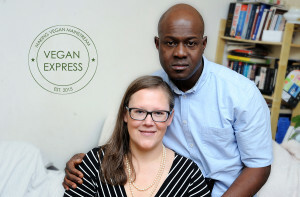 Charles and Ulrika Diallo own and run Vegan Express Limited. Charles has more than twenty years’ experience of cooking and running kitchens in the UK and abroad. His passion for vegan food comes from finding great flavour in fresh produce that makes little or no impact on the environment. “The winning formula behind our success is making food from scratch. We will never serve processed products from wholesalers. We make all our food on site focussing on flavour and texture. Our ambition is for Vegan Express to become a first-class vegan restaurant. Charles’ motto has always been that you are only as good as your last plate of food and his drive comes from constantly developing and improving his methods and skills. We can cater for parties, corporate and private events, weddings, birthday parties etc. We can produce free from, egg-less, gluten free cakes and muffins and other sweet treats and party food.